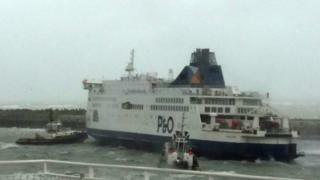 A P&O ferry carrying several hundred passengers has been set afloat again after running aground in the French port of Calais during a storm. Nobody was hurt in the incident but traffic across the English Channel was disrupted. Two tugs with cables were used to pull the vessel off a sandbank, a local newspaper reports. They worked in winds of 120km/h (75mph) as waves hit the sides of the ship, La Voix du Nord reports. The ferry was identified as the Pride of Kent. P&O confirmed the incident in a statement. "There are no reported injuries, the ship was refloated within two hours and we hope to transfer our passengers to an alternative ship as soon as possible," the statement said.